HP has its own Surface Pro clone that offers a lot of features for a pretty reasonable price. Like the Surface Pro line, but don’t like its price? HP thinks it has the answer for folks who can only afford a Surface 3 but really want a Surface Pro 3. The company’s newly announced Spectre 12 X2 competes directly with Microsoft’s Surface Pro line but at a more aggressive price. 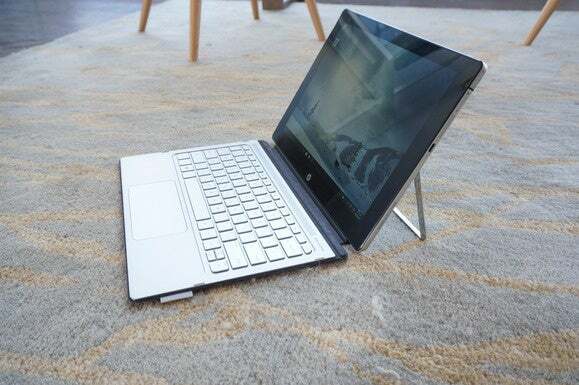 The style and shape will seem similar of course: It’s a Surface clone. The Spectre 12 X2 features a 12-inch, 10-point touch screen, active pen support, and a keyboard that attaches using magnets and even snaps onto the tablet to improve lap use. There’s a lot of key differences between the now displaced Surface Pro 3 and HP's new Spectre though. The most important one is the CPU. The Spectre uses Intel’s latest Skylake-based Core m3 or Core m7 CPU. That should give it a leg up in battery life and acoustics and maybe even performance. I’ll discuss that more later. HP’s Spectre 12 X2 is almost as cheap as the Surface 3, while offering features and performance more comparable to a Surface Pro 3. Why is it a Surface Clone? What makes the Spectre 12 X2 a Surface clone rather than a standard “2-in-1” or detachable? Everyone will have opinions on that but I think it’s the kickstand. Detachable devices have been around for some time from several different vendors but the Surface is fairly unique with its kickstand. 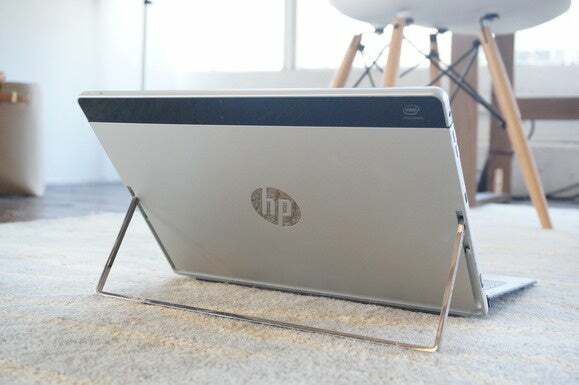 HP’s take—and by the way, it is indeed HP as in "post-split, the PC company will no longer be allowed to use the name Hewlett-Packard" HP—on the kickstand is to use a U-shaped metal bracket. 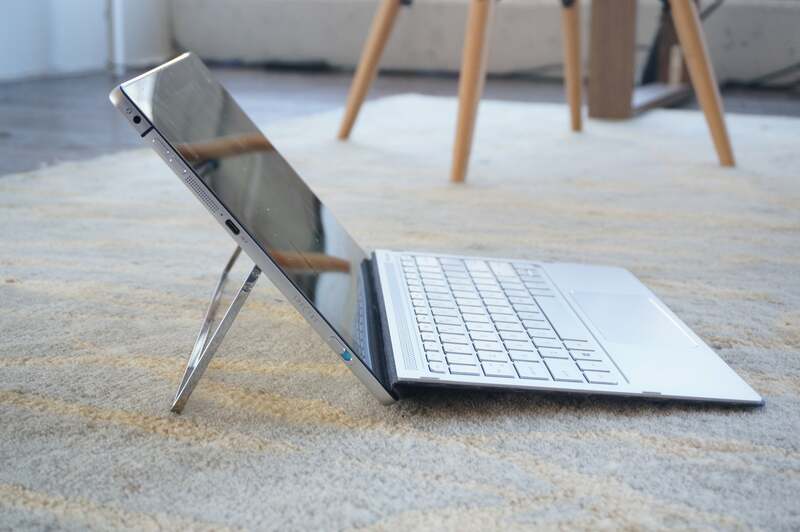 The kickstand itself requires you to slide a switch to pop it out, rather than just pulling it out like on a Surface. The kickstand on the Spectre 12 X2 folds back to 150 degrees and pops out with a switch. HP said it did this to mostly increase battery life; the U-shape means it doesn’t have to mill more material out of the back of the body. 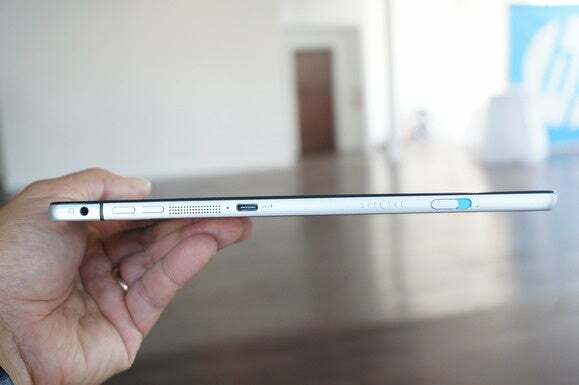 That maybe only 1 or 2 millimeters, but that extra space can be dedicated to more cooling or a bigger battery. For the record, the Surface Pro 3 is about 9.1mm thick and packs a 42.2 watt hour battery. The Spectre is 8mm and also packs a 42 watt hour battery. Battery life, the company says, is rated at 10 hours using the latest version of MobileMark 2014. That’s the gold standard for battery testing of a PC in a realistic-productivity test. However, there’s also a feeling that MobileMark 2014 is too light of a workload. We’ll find out when we actually get a Spectre 12 X2 in for testing. 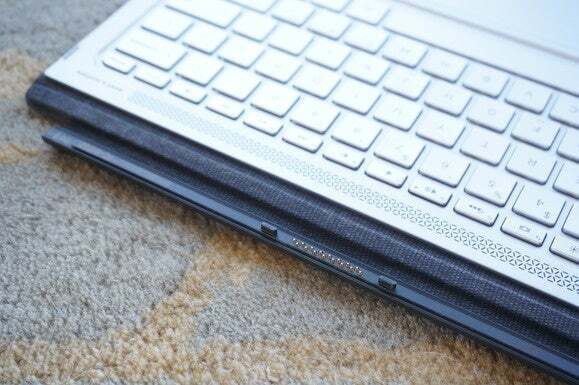 HP also veers from Microsoft’s use of a higher resolution panel, which can affect battery life. While the Surface Pro 3 features a 2160x1440 screen, the Spectre’s is 1920x1280. The Spectre 12 X2 keyboard comes with the unit and connects using magnets. Despite it looking just like the Surface connector, HP says they’re not compatible. In front there’s the standard issue 5-megapixel camera but in back there’s an 8MP Intel RealSense camera. It’s an interesting choice that may prove to be a thorn for some. Intel’s RealSense camera is one of the criteria to use Windows Hello, which automatically unlocks your PC when only you’re in front of it. If you’re into that kind of thing, it won’t work on the Spectre, since the front-facing camera lacks Intel's technology. But putting that RealSense camera on the back means you can do other nifty tricks, like make 3D scans of objects. The RealSense camera in back of Dell’s Venue 8 7000 tablet lets you use the camera as a ruler. Unfortunately, the last time I tried it, it was mostly good just for parlor tricks. The IPS screen’s resolution is 1920x1280. One of the big improvements the Surface clones will have over the last generation Surface Pro will definitely be temperature. The Surface Pro 3 used a 15-watt, Haswell-based Core i7 chip. While it was great on short bursty usage scenarios, tasking the Surface Pro 3 with anything strenuous for longer than a few minutes would cause performance would drop as it heated up. Unlike with a laptop, you’re talking about a pretty hot CPU packed into the same body as the device's screen. That adds up to a lot of heat and rather than set you on fire, Microsoft chose to turn the CPU’s clock speeds down. A Surface Pro 3 will actually run at almost half the speed of a laptop with the same CPU on lengthy tasks such as gaming or encoding. Just browsing with Chrome would cause the Surface Pro 3 to turn on its fans. Putting a case on the Surface Pro 3 costs you even more performance. I imagine the Surface Pro 4’s use of Intel's newer Skylake chips will greatly help, but I won’t know for sure until I test it. If HP and Intel did its homework, those problems shouldn’t inhibit the Spectre as much—or possibly at all. With the Skylake-based Core m putting out a third the heat of the Haswell CPU in the Surface Pro 3, I expect thermal throttling to less prevalent with the Spectre. There’s a very good chance the Spectre will outperform the Surface Pro 3, or at the very least be just as fast without the fan noise. The proof is in the Jell-O pudding though, so we’ll have to wait to get our hands on a unit. The Spectre 12 X2 is 8mm thin and 1.78 lbs. With its keyboard, it’ll push 13.2mm and weight 2.7 lbs. For ports, it’s pretty slim pickings. You get a USB-C port on both port and starboard sides of the laptop. Either of the ports can be used to charge the unit, too. There’s no USB-A but HP gives you a dongle so you can, say, plug your USB key or external drive into the Spectre. The ports aren’t compatible with Thunderbolt 3.0 or USB 3.1 either. The good news, of course, is you get two. What’s not clear to me is if the Spectre 12 X2 supports MHL, which would let you run a monitor out of the ports. Let’s hope it does. There’s also a microSD port aboard for those who need more local storage. The really nice touch for those who are interested in always being connected is support for Verizon LTE in the Spectre. It’s included in both SKUs and can be activated by the customer. The real eye opener is how aggressive HP is being with the Spectre’s pricing. The base version of the Spectre 12 X2 features a Skylake Core m3-6Y30, with 4GB of DDR3L, a 128GB M.2 SSD, LTE and 802.11ac Wi-Fi for $800. Mind, you that’s with the keyboard. 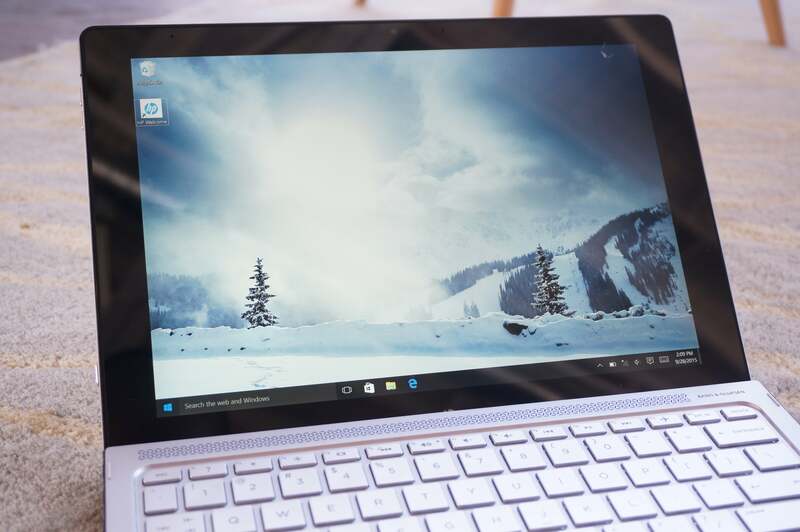 The Atom-powered Surface 3 with 128GB of storage is $600 without a keyboard. The Type Cover is another $130. If you wanted an LTE version, you’d be looking at another hundred bucks for the Surface, or $830 for the Surface 3 with a ho-hum Atom processor instead of a Core m3. Moving up to the Surface Pro 3 with 128GB of storage, you’d have to spend $1,030 with the keyboard. To be fair to Microsoft, you do get the stylus thrown in with the SP3. HP, it seems, won’t include the Spectre 12 X2's active Wacom pen in the package. Microsoft’s newest Surface Pro 4 changes the equation somewhat. Just announced yesterday, the SP4 gives the Surface a badly needed CPU update to Intel’s latest Skylake chips, with Core i7, Core i5 and Core m3 versions available—but it’s still fairly pricey. The base Surface Pro 4 gives you a Core m3, 4GB of RAM and 128GB of storage for $900. Add $130 for the type-cover, improved as it is, and you’re still looking at $1,030 without LTE. The higher-end Spectre ups the CPU to a Skylake Core m7-6Y75, 8GB of DDR3L, and a 256GB SSD, with remaining parts appearing to be the same. HP didn't divulge pricing information for the fully loaded version. Of course, we haven’t formally tested either the Surface Pro 4 or the Spectre 12 X2, but it’s brewing up to be a massive brawl for who can out-surface the Surface.